May Flaum here to do some creative frolicking with my new favorite Jenni Bowlin punch, a cool stencil, and the modern mercantile papers too. What i really love about this punch is that it can be used alone, or it is great in a group as well. You can see I used it to make a sort of grid to place under my title, and also under my buttons for added interest and almost a sunburst like feel. My stenciling was done with ink and a bit of foam to rub it - I love the color I can get this way. I'm also loving the Jenni Bowlin paper tapes - which I've used for the first time here on this layout! 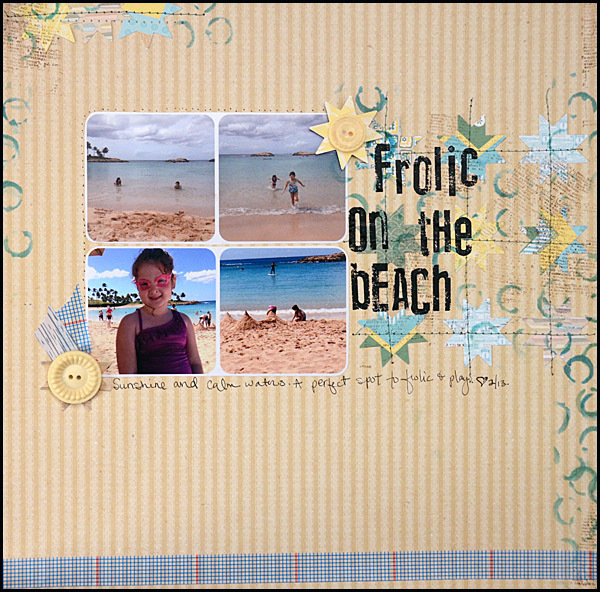 I hope you can make some time for a creative frolic soon - it sure is fun to ink, stamp, and play!